Around 1911, within the dark and sweaty confines of a copper mine in Bingham Canyon, Utah, sixteen-year old Jack Dempsey got angry and showed a select audience what the future held for him. The lean and muscled youngster was working quietly on his own when the bully of the crew started throwing dirt at him for a laugh. Dempsey gave his tormentor every chance to desist, but then the bully made his biggest mistake by starting to swing his fists. Jack began to circle him in the chilling manner that he would circle and snare so many great heavyweights in the years to follow. Fellow miners who had picked up on the commotion began to lay bets as they waited for the first blow to be struck. They didn’t have to wait long. Only one punch was thrown as Dempsey crossed a right to the jaw and knocked his man out. This was the kind of tough life that Jack Dempsey led, before he even got around to he tough business of prize-fighting in earnest. In the gentler and more accommodating era in which we now live, it is essential that we do not forget the unforgiving, rough-and-tumble canvas on which the fighters of Dempsey’s era had to paint their masterpieces. In ranking the fighters of different eras, most of us are guilty of setting the usual parameters and using the familiar old yardsticks: number of fights, number of wins, championship reign, quality of opposition etc. What we seldom do, in the case of older boxers, is dig beneath the surface and assess the number of ‘life’ fights they had to win before they became actual fighters. There is nothing misty-eyed or romantic about making such comparisons and highlighting the hardships of boxers from early times. For we are certainly not harking back to the ‘good old days’ when everything in the garden was rosy. Ordinary folk in Dempsey’s era had to work insufferably hard in the hope of breaking even, often travelling huge distances to obtain work. Jack and his family uprooted from the ‘feud country’ of West Virginia and hauled themselves all the way out to Manassa, Colorado, for a new life and a new chance. Many other poor families did likewise. Ill health was dreaded, because so many illnesses were incurable. Diabetes, now so common and manageable, was a killer before the discovery of insulin in 1919. People with mental problems went straight to the asylum, because they surely had to be mad. Captains of industry couldn’t rely on analysts to tell them to wear a coat when it rained. A generation of young men from Boston to San Francisco hacked away at menial jobs in the hope that something better – anything better – would show up. Jack Dempsey, before he met Jack Kearns and Tex Rickard, before he even became Kid Blackie, was just one young man trapped in this frantic hive of quiet desperation. He travelled for miles, rode hobo-style on the rods of trains, worked at back-breaking jobs and frequently got knocked back. But Dempsey had one crucial ace in the hole. Unlike so many of his contemporaries, he wasn’t drifting aimlessly. He knew his strengths and he knew what he wanted to do. That initial victory in the Bingham Canyon mine, small and irrelevant in the great scheme of things, had fired Jack. The other miners wanted to shake his hand. Suddenly he was somebody special. He had worked the mine with his older brother, Bernie, but no longer was he seen as Bernie’s kid brother. History blurs our perception of many fighters, to the point where we are often left with unfair and inaccurate stereotypes. Jack Dempsey is a pertinent case in point. Generally grouped together with the likes of Rocky Marciano, Joe Frazier and Mike Tyson, Jack is lately classified as a swarmer and a slugger. A good number of today’s fans even dismiss Jack as a ‘crude banger’, presumably on the basis of the few old, herky-jerky movies we have of him. Jack’s weaving style was one of his greatest strengths. Unlike most of the fighters he is now compared to, he rarely attacked in a straight line. He circled constantly, mixed his punches and could box when boxing was called for. It was Fleischer’s considered opinion that Dempsey possessed science and cleverness far above the ordinary boxer. Without doubt, however, Jack’s greatest gifts were his punching power, his ability to hit correctly and his innate sense of timing. He was blessed with tough, big-boned hands, which were unusually square across the knuckles. The manual work of his early days equipped him with the powerful arms, shoulders and back which were the engine room of his punching power. Hi leverage was exceptional, as he combined the muscles of his legs with his upper body for maximum impetus. These were the important factors that set Dempsey apart from his supposed soul brothers in boxing history. Jeffries, Marciano, and Frazier were so often likened to marauding bears. Jack was a tiger, and there was the difference. Only the prime Tyson matched him for the shocking speed and impact of his attack. By 1916, Jack Dempsey was still very much a rough diamond in need of polishing, but the emerging talent was there for all to see as he began to hit the road and take any fights he could get in the sprawling towns of the Old West. He jumped a freight train and rode the rods into Salt Lake City, where he had a great idea. Jack needed stiffer competition and he knew it. He had been fighting professionally for around two years, knocking over amateurs and semi-pros whose names sparkled far more greatly than their talent: guy like Chief Gordon and Two Round Gillian. Walking into a gym, Dempsey introduced himself as Kid Blackie and boldly announced that he would fight any man available. But Jack’s reputation was already spreading and he found only a few takers, fighting them for peanuts. He took a job as a porter at the Hotel Utah in return for free food and board, engaging in fights when he could get them. But the competition was drying up fast as many ambitious young fighters began to head East for the real action. Dempsey still didn’t consider himself ready for that kind of move and made the decision to head back to his native Colorado via the rods. You have to ask yourself how many young fighters today would opt for a less strenuous way of life in such trying circumstances. Dempsey was giving of his best and getting no return. Just a year before, he had lost his earnings of a hundred dollars after his losing fight with the tough Johnny Sudenberg in the brutal heat of Goldfield. When Jack woke up the following morning, stiff and bruised and feeling as if he had been in a stampede, he discovered that his money had gone along with his carefree manager. Dempsey sucked up all these disappointments, so determined was he to make the grade. The tough life only served to make him a tougher man as he rode the rods back to Colorado by way of the hobo jungles. There were times when he was kicked off the train by rail officials, often in the middle of nowhere. Hanging precariously to the rods, Jack would battle to keep himself warm in the colder months while shutting his eyes to avoid the blinding cinders. Tiredness was his most dangerous foe. The mail trains would hurtle along the track at up to seventy miles per hour and Dempsey would tie his hands and feet to the train’s lower rungs with light chains or anything he could find. In Colorado, Dempsey would walk into saloons and challenge the local toughs to fight him. Jack won most of these brawls, but the pickings were still lean and he was going nowhere. He had to make the big move. The big move East. When Dempsey and his latest manager Jack Price hit New York in the summer of 1916, the Big Apple was experiencing a sapping heatwave. The two men looked hideously conspicuous as the trudged the sidewalks. They had less than thirty dollars between them and badly needed a bath and shave. Dempsey was carrying what little he possessed in a cardboard suitcase. But Jack was eager to get on and establish his presence in this new and intimidating arena. He visited as many of the city’s sports editors as he could find, eagerly telling them about his twenty-six knockout victories and showing them his press clippings. He quickly learned that New York was a parochial giant which had little knowledge or regard for anything going on elsewhere. None of the sports hacks had heard of the kid from Colorado, nor of some elaborately named guy called the Boston Bearcat, who was Jack’s most notable victim to date. Back in Ogden, Utah, in February of that year, Dempsey had knocked out the enormous Bearcat with a salvo of punches in the first round. To Jack, that meant everything. Rumour had it that even the great Sam Langford hadn’t been able to knock the tough and charismatic Bearcat off his feet. But that was Ogden, Utah, and where the hell was that? Most New Yorkers were more familiar with London. Only one man gave Dempsey the time of day, and that was the astute and worldly Damon Runyon, who originally hailed from a very different Manhattan in the wilderness of Kansas. Runyon put himself around just as Dempsey did. He had seen Jack fight and had liked what he saw. He told the disillusioned youngster that it was a devil of a job to make an impact in New York and not to give up the fight. Dempsey would remember those words and learn their value as he soldiered on, gamely trying to sell himself to the big city whilst hoping to hook up with one good and honest manager who could stay the distance. Jack Price was already close to heading back home after receiving a wire to say that his mother was ailing in Salt Lake City. He and Dempsey were getting on each other’s nerves in the cheap room they shared, where the luxuries included a bed, a sink and a light bulb. Dempsey was training at Grupp’s 116th Street Gym and had one more fight under Jack Price’s management, a risky assignment at the Fairmont Athletic Club against a blond giant called Andre Anderson. It was a wild slugfest and very nearly a disaster for Dempsey, who was pitching his 173lbs against Anderson’s 215. Big Andre went for the fast knockout and decked Jack several times in a tumultuous opening round. Some ringsiders urged the referee to stop the fight, but Dempsey clawed his way back into the fray and had Anderson on the run at the end of ten bruising rounds. The fight was a no-decision affair, but Damon Runyon tabbed Jack the winner and praised the raw young tiger in his morning report. It was the night that Jack officially became Jack Dempsey. Runyon dubbed him the Manassa Mauler. One step forward and two steps back. This was the story of Dempsey’s life as he struggled to break free from the pack and surge through the fiercely competitive field of his day. When Jack Price went back to Salt Lake City, Dempsey had another nasty surprise. Business was very often conducted on a simple handshake at that time, and Dempsey never did have an official contract with any of his managers, including Jack Kearns. Along came a character called John ‘The Barber’ Reisler to inform the young fighter that he was under new management. Reisler claimed that Price had sold him Dempsey’s non-existent contract. John The Barber also had some fancy ideas about Dempsey’s next opponent, dropping the names of such established killers of the ring as Sam Langford and Gunboat Smith. One ferocious body blow from Johnson in the second round doubled Dempsey up and had him in big trouble. Suspecting that Johnson had cracked a few of his ribs, Jack was in terrible pain for the duration of the fight. Again, however, the young Mauler impressed the crowd by hanging tough and punching back with such success that the assembled sportswriters were divided on who had won. Dempsey needed time to rest his aching body and contemplate the jam he was in with John The Barber. He took some vacation time and went back to Colorado to see an old friend, but the fresh air and gentle scenery failed to soften the blow of coming back to New York. John The Barber was still full of lofty ideas and brought up the name of Gunboat Smith again as an opponent. Dempsey was at the end of his tether with such fanciful suggestions, and his mood darkened further when his so-called manager suggested the big punching Frank Moran as an alternative choice. Jack knew he still wasn’t sufficiently prepared for such formidable competition. The pounding he had taken from John Lester Johnson was surely proof of that. He and John The Barber had a violent argument, which concluded with Jack storming out and making the decision to pack his bags and get out of the great and sprawling city. He couldn’t have dreamed then that one day he would become one of its permanent fixtures and a living legend. In those stormy days of 1916, it seemed that the grey giant of New York had slain the young tiger and drained him of his resilience. 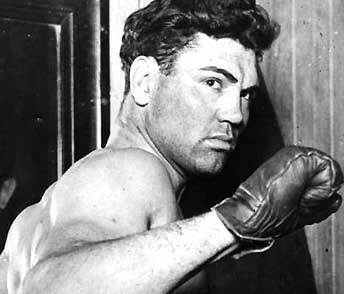 But Jack Dempsey was made of sterner stuff. Over three breathtaking years, he would become the complete fighter and begin his fantastic run to the world championship. When he returned to the concrete canyons, he was the prince of the city and the king of the world.